These apartments make a very attractive holiday pad, place to live or long-term investment. This is an opportunity to buy a stunning upmarket apartment in a beach-front location that provides unimpeded views and all day sun, and is close to a host of local attractions in and around Paraparaumu Beach. You can relax beside the heated swimming pool, lie on the lawns or stroll to the many nearby attractions, including the internationally ranked Paraparaumu Beach Golf links. There is nothing on the Kapiti coast that compares with the quality and location of these two and three-bedroom apartments. They are simply the best on the coast and literally in a world of their own. Built just across from the beach with amazing water and island views and set around the landscaped garden and pool, The Pier apartments were completed last month and owners are now moving. With prices from $495,000 to $750,000, these apartments make an attractive investment, especially compared with other locations in New Zealand. 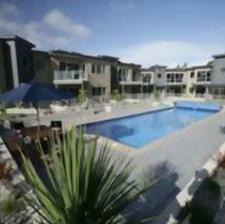 With Kapiti being one of the fastest growing regions in New Zealand, the demand for these apartments can only increase. Each apartment is finished with granite benchtops, two fully tiled bathrooms, underfloor heating in the living areas and bathrooms and high security. They have a built in feeling of space with generous 2.7m (9 ft) studs and 2.2m doors. They also come with their own solar water heaters, which take advantage of the high sunshine levels and give major savings on powerbills. When not being used by owners, the apartment looks after itself given the high level of security, secure covered car parking and the live in building manager. You could even let them out. Floor space ranges from 109 to 141 square metres. They have large decks and patios. The exterior of the building is clad in time proven materials with blonded cedar timber weatherboards, deep blue titan panels and copper spoutings, downpipes and details that give it a timeless appearance.